Understanding the tobacco giant's success provides a roadmap to its future. Few stocks have given investors as strong performance as Altria Group (NYSE:MO) over the decades. Even though the prevailing trend in the U.S. has been toward fewer people smoking rather than more people, Altria has nevertheless found ways not only to sustain its profits but to grow them over time. Below, we'll give you three different pictures that explain how Altria has been able to deliver just about exactly what shareholders have wanted to see, and many of those favorable trends seem poised to continue for the foreseeable future. Altria's share price has risen steadily over the years, and investors have been drawn to its consistent earnings growth. As you can see in the chart below, when you look just at Altria's stock price alone, you can see how much shareholders have benefited from the growth in Altria's business. Yet equally important as a contributor to Altria's long-term total return has been its dividend. The line above marked "total return price" incorporates the dividends that Altria has paid into its past performance. As you can see, the two lines end up in the same place, but the much lower path for the total return price line indicates that the overall gains when you include dividends are much higher than when you look at share price alone. 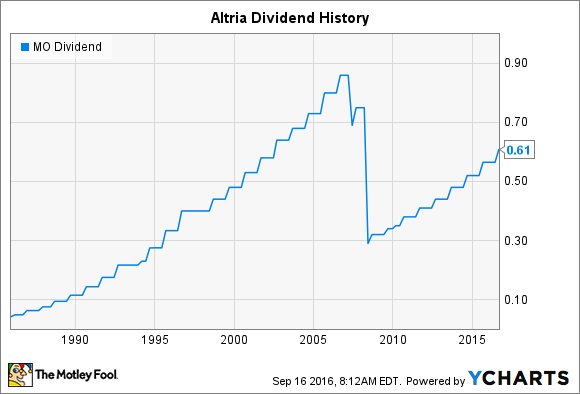 Drilling down on the dividend issue, Altria has an impressive track record of not only offering healthy dividends but also raising those payouts consistently over time. The company has raised its dividend 50 times over the past 47 years, including an 8% payout increase within the past month. The chart above is misleading because it indicates a big dividend cut in the late 2000s. However, that downward tick followed the spinoff of Philip Morris International, after which Altria contained only the U.S. operations of the former global tobacco conglomerate. 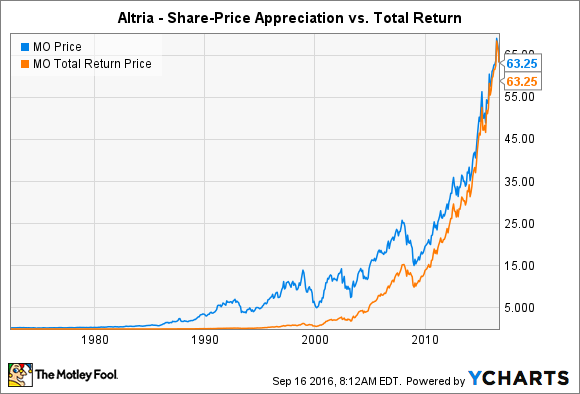 With yields that have almost always been considerably higher than the average in the stock market and with its history of regular increases on an annual basis, Altria has treated income investors very well over time. What's most impressive about Altria's performance is that it has come in the face of a huge secular decline in smoking within the U.S. market. As you can see from the chart below from the Centers for Disease Control and Prevention, the percentage of Americans who smoke has fallen by more than half over the past 50 years, and the agency is optimistic that it can reach even lower levels of just 12% by the year 2020. The decline in smoking has led Altria to follow multiple strategies to sustain its growth. On one hand, Altria has worked hard to try to build up its market share, fully leveraging the Marlboro brand to squeeze as much value out of it as possible through product innovations and other strategic moves. The resulting pricing power has helped Altria keep increasing profits even when sales volume has fallen. At the same time, Altria is pursuing other avenues for future expansion. The potential demand for reduced-risk offerings like e-cigarettes, e-vapor products, and heat-not-burn tobacco products is huge, and the popularity of alternatives to traditional cigarettes has been stronger and longer-lasting than many investors following Altria had expected. Altria's diversification with its wine business and its sizable stake in beer-maker SABMiller also gives it exposure beyond the tobacco market, and that could become even more important if cigarette smoking continues to wane. Altria has had a long and storied history, and it has overcome several obstacles in helping its investors earn impressive returns. By following its existing strategies as well as looking for new ways to thrive, Altria has the potential to keep growing well into the future.